In the present work the effect of different diluents were studied on the release profile of Lamivudine from sustained release matrix tablet by using Kollidon SR as a release retarding agent.Sustained release matrix tabletof Lamivudine were prepared by direct compression method using Kollidon SR as a release retardant. Lactose and Microcrystalline cellulose were used as diluents in different concentration. Compatibility study was carried out by FT-IR. The powder were evaluated for their flow properties and tablet were evaluated for hardness, friability, thickness, % weight variation, % drug content and in-vitro dissolution test. N. A. Pragathi*, S. Parthiban, A. Vikneswari, G. P. Senthil kumar, T. Tamizmani. The purpose of present research was to develop and evaluate gastro retentive floating drug delivery system of an antiretroviral drug Zidovudine using natural polymers. The floating tablet of Zidovudine was prepared by direct compression method (effervescent method) by using natural polymers like psyllium husk powder, guar gum, xanthan gum. The results of pre-compression and post-compression parameters of all the formulated tablets were shown satisfactory results which complies with official limits. The compatibility study by FTIR confirmed that there is no interaction between the drug and the polymers used. The floating lag time and swelling index were found to be significantly increased with increasing concentration of the polymers. After the dissolution study of prepared Zidovudine floating tablet, it was concluded that the P4 formulation prepared with Psyllium husk powder shows better sustained release effect. The developed floating tablet of Zidovudine used to prolong drug release for more than 12 hrs, thereby improving bioavailability and better patient compliance. P. V. Nayana*, S. Parthiban, G. P. Senthil kumar, A. Vikneswari, T. Tamiz Mani. The aim of the present study was an attempt to formulate and evaluate taste masked fast disintegrating tablets of Captopril to increase the palatability and bioavailability of the drug. Fast disintegrating tablets of Captopril were prepared by direct compression method using β-cyclodextrin as a complexing agent to mask the bitter taste of Captopril. Guar gum as natural super disintegrants was used in different concentration 2.5 mg, 5 mg, 7.5 mg, 10 mg respectively. The Captopril - β-cyclodextrin complex were characterized by FT-IR, DSC and XRD. Compatibility studies by FT-IR showed no significant interactions between drug and excipients. DSC and XRD analysis confirmed the formation of complex for taste masking. The developed tablet formulations were evaluated for pre compression and post compression parameters which complied official limits. Among all the formulations, formulation F4 containing guar gum 10 mg gives best disintegration and dissolution profile compared with other formulations, showed drug release of 99.86±0.54 % with 12 min and disintegration time 50.16±1.32 sec. From this study we concluded that the formulated tablets of Captopril containing guar gum of concentration 10 mg was better and effective than conventional tablets to meet patient compliance along with fast relief from hypertension. Sunitha H S*, S. Parthiban, A. Vikneshwiri, G.P. Senthil kumar, T. Tamiz Mani. Now a days, revelation to noxious heavy metals vestiges an extensive widen professional and ecological tribulations in world. With the increment of urbanization as well as population, human are exposed due to widespread use in industry, agriculture and even as a medicine. In miniature, certain heavy metals are nutritionally important for a healthy life but it becomes toxic when they are not metabolized by the body and accrue in the soft tissues. Especially, currently, lead, cobalt, chromium and arsenic greatly interferes with a number of body functions like haematopoietic system, central nervous system, liver and kidneys. Despite of several efforts, we are still far from an effective treatment of chronic heavy metal, lead poisoning. The study has given overview about the adverse effect of lead in human and also recent strategies like antioxidants, herbal protective agents that took up for a protected, efficient and particular dealing for toxic metals like lead. Ranajit Kumar Khalua, Satyajit Tripathy*, Bhagyasree Paul. The aim of the present study was to enhance the dissolution of a practically insoluble Meloxicam by liquisolid compact technique. Liquisolid compact is one of the most promising and new techniques, which promotes dissolution rate of water-insoluble drugs. Orodispersible liquisolid compact of Meloxicam were prepared by direct compression method using PEG 600, MCC and silica gel as non-volatile solvent, carrier, coating material respectively and psyllium husk powder as natural superdisintegrants in different concentration 2.5 mg, 5 mg, 7.5 mg, 10 mg respectively. The liquisolid compact were characterized by X-ray powder diffraction, DSC and FT-IR respectively. Orodispersible liquisolid compacts of Meloxicam tablets (F4) containing psyllium husk powder exhibit quick disintegration time and maximum drug release. J. Hamsanandini *, S. Parthiban, A.Vikneswari, G. P. Sentil kumar, T. Tamiz Mani. 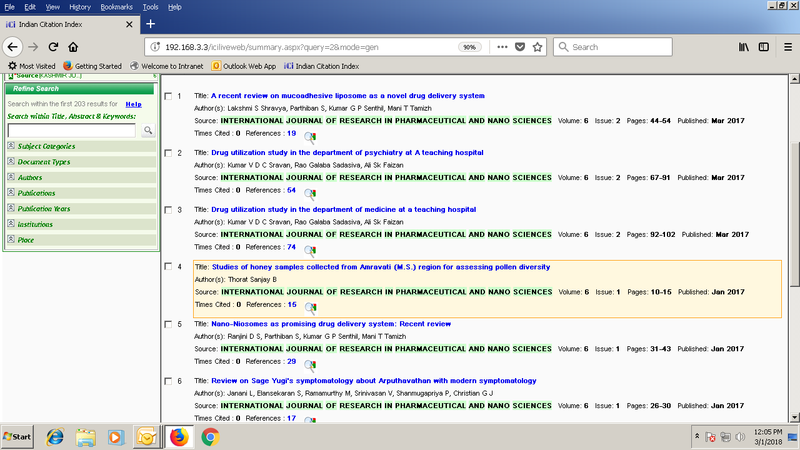 The aim of the present research work was to investigate the influence of effect of mucoadhesive strength of sodium alginate and guar gum on Gliclazide loaded buccal tablets were fabricated with objective of avoiding first pass metabolism and to improve its bioavailability with reduction in dosing frequency. Mucoadhesive buccal tablets of Gliclazide were prepared by direct compression method. The mucoadhesive polymers used in the formulation were carbopol 940, sodium alginate, guar gum in different ratios. The compatibility study by FTIR confirmed that mucoadhesive polymers were compatible with the drug.The results of pre-compression and post-compression parameter of all the formulated tablets were shown satisfactory results which complies with official limits. The comparative in-vitro study of the optimized formulation S4 showed better sustained release 80.60 % than the other formulation. Among the formulations the combinations of sodium alginate and carbopol-940 have shown optimum bioadhesive strength. Formulation S4 showed maximum percentage of swelling index 145.61 after 8 hrs. The in-vitro release kinetics studies revealed that all formulations fit well with Peppas model kinetics and followed Non-Fickian diffusion mechanism. K. G. Krupashree*, S. Parthiban, A. Vikneshwari, G. P. Senthil kumar, T. Tamizmani.